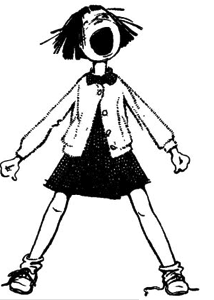 Jane and I almost bought a house on Klickitat Street, the same street where Ramona Quimby lived. Even back in 2000, houses in Portland were expensive. Jane was pregnant and the startup I worked for was failing. We just wanted somewhere to live, to put down roots. We looked at a tiny house in Southwest. The backyard was huge and the landscaping was perfect but it was out of our price range, even though it was only 1000 square feet. There was a 3-story monster in Northeast close to the river. The neighborhood was a little rough but up and coming. The house was amazing. Hardwood floors, wooden banisters, dark crown molding in every room. But half of the second floor had been torn up and the entire third floor was down to studs. It would’ve been amazing if we were handy, if we could’ve lived there while working on it. And then there was the house on Klickitat Street. A blue house near NE 42nd, it was a decent size and right in our price range. It seemed perfect. The woman who’d owned the house left it to her college-age grandson when she died. The grandson and his friends had been living in it for years and had destroyed the house. The backyard was covered in 2 feet of garbage. You couldn’t even see the ground and the inside was even worse. Inside reeked of urine, beer, and smoke. Cigarette butts, empty bottles, torn carpet, holes in every wall with wires hanging out. Every bathroom covered in mold and the kitchen was full of garbage and dirty dishes. It would’ve taken the cost of the house over again to fix it up. It made me so sad to see this neglected house on Klickitat Street, waiting for someone to come and love it.